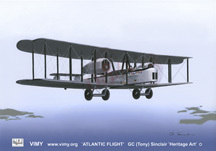 The Vimy Aircraft Project is supported, in part, by proceeds received through the sale of Vimy-related merchandise. 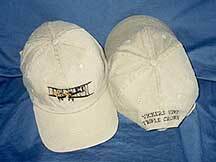 By buying Vimy souvenirs and keepsakes, you help keep the Vimy flying. Original art reprinted on high quality acid free paper with ink that lasts approximately 85 to 100 years. Sizes available: 8 1/2" X 11 " and 13" X 19"
Biography of Artist and Artwork process. 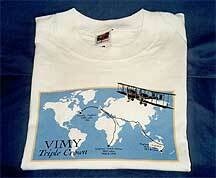 All cotton T-shirt with Vimy Triple Crown journey map and dates of original flights. Because our volunteer staff is small and we do not have the resources to fulfill orders, we rely on partner organizations to handle sales for us. Clicking BUY links on this page enables you to order products via a secure server from one of our partners, HistoricAviation.com and Amazon.com. If you have any questions about ordering merchandise, please contact the appropriate partner directly, via links on its Web site.